This summer Barbados invites travelers to live like a local and experience the island's lively Crop Over Festival, celebrating a 200 year-old tradition that honors the end of the sugar cane season. The six-week festival celebrates all that is Bajan with dusk till dawn parties, arts and crafts markets and a culinary-driven street fares. Grand Kadooment Day celebrates the end of Crop Over, where Masquerade Bands make their way to Spring Garden highway with revelers dressed in sequin costumes decorated with colorful feathers, jewels and bright accents; dancing behind music trucks and moving bars. The finale of Crop Over's events makes this the island's most exciting day of the year. As you will hear Bajans say: "Crop Over it sweet fuh days!" The Crop Over celebration recalls our colonial past when sugar cane was king, and creativity abounds with indigenous art, craft, calypso, flower festivals, folk concerts and revelry at Foreday Morning. But it is Grand Kadooment - the climax of the festival - which generates the most heat, energy and colour! The event is great fun for everyone, even if you're watching the masqueraders from the sidelines and not "jumping" in a costumed band. Revellers, among whom are countless international celebrities, including our very own mega star, Rihanna, make their way through the streets in a kaleidoscope of colour to the Spring Garden Highway, where the party continues well into the night with more revelry, music, food and fireworks, set against the picturesque backdrop of Brighton beach. Save up to 40% off your stay using Expedia and claim this exclusive Dine Around offer. Enjoy a full 3 course dinner at an amazing rate. BDS$99 / US$50 per person. A bottle of wine is included per dining couple. To redeem this offer, Bookings must be made in advance with respective restaurants and is subject to availability. 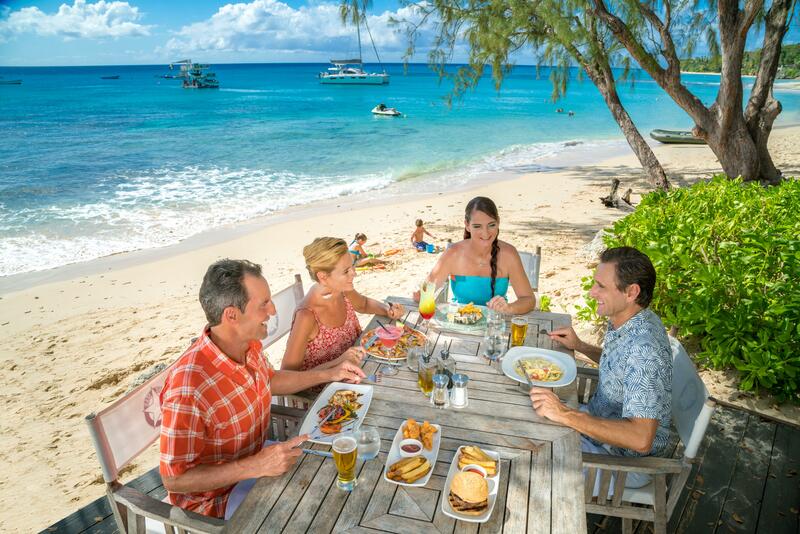 Remember to request the “Re-Discover Barbados Menu" when making your reservation. The Crop Over Festival is a 3 month long festival of Barbadian music, arts, food, culture and so much more. Barbados ends the festivities with a grand carnival parade know as Kadooment Day. Kadooment is known as the biggest and sweetest carnival to end the Caribbean's carnival season in August each year. The event starts early morning at the National Stadium and beautiful masquerade bands traverse the local city streets ending on Spring Garden highway late in the afternoon. Take a look at the Barbados Kadooment band list below for all of Crop Over Kadooement bands participating for 2018.